Metric Insights must be installed on a hardware platform that has a fast file system and has sufficient memory, cores, and storage to run your application. See system requirements for a Metric Insights server for a detailed list of requirements. Point your browser to the CNAME that you have created for your server (for example, insight.yourcompany.com). The system will automatically re-direct you to the login page. If you do not have a CNAME setup, you can use the IP address for the server. 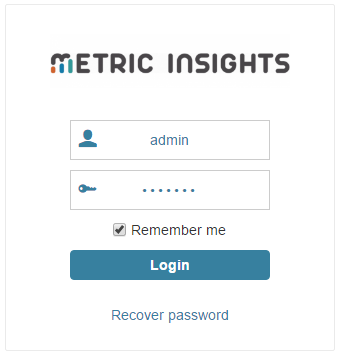 Login using the temporary admin password that Metric Insights has provided you. You should now see an empty Home Page.